Not all washable keyboards are created equal. Before making an investment in peripherals that enhance infection control, ask yourself if the product meets all the criteria listed below. Washable open style keyboards are not an acceptable standard of care in medical environments where blood, bio-burden and gross contaminants are prevalent. When you see the icon to the left, you know that you have found a keyboard that meets all 10 requirements of a Medical Grade™ Keyboard. The keyboard should be fully sealed and seamless. Nothing can hide under keycaps. Terminally clean with a 1:10 bleach solution. Keyboard can handle any EPA approved disinfectant. Keyboard should be lockable for disinfecting at the workstation in between patients or shifts. Splatter matters. 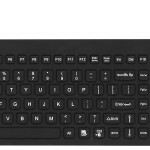 With a black keyboard, you cannot see all visible contaminants. A keyboard needs to stand up to typing by multiple users 24/7 and repeated harsh cleaning and disinfecting. Typing gloved, or even double gloved, should be just as easy as typing glove free. For folding trays, a magnetic attachment system is needed to avoid the use of dirty Velcro™ or tape. Adjustable backlight is needed for accurate typing in low light environments such as patient rooms. Keyboards need to be flat to avoid repetitive motion issues. Silent keyboards will not disturb patients. These substances have never been shown to support infection control and patient safety. They may only protect the product. Most keyboards that you find in hospital are the same keyboards that came out of the box with the computer. Research shows that the dirtiest object in a hospital is often the keyboard, to combat this many hospitals have started cleaning their keyboards and mice to prevent HAIs and other illnesses being passed around. 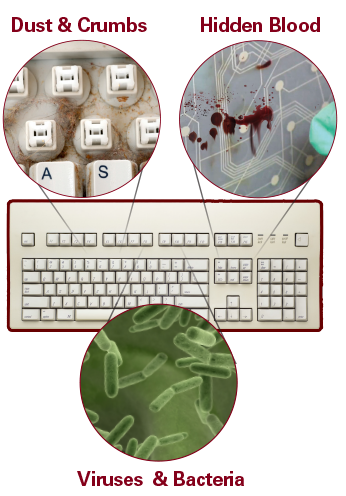 Typical keyboards can’t hold up to the rigorous cleanings required to enhance patient safety and infection control. They have seams that allow liquid to penetrate, moving parts that fail. Man & Machine makes cleaning easy. Our competitors claim that using antimicrobial additives in a keyboard will help make it safer for medical facilities. We disagree. Studies show that antimicrobial additives like triclosan do not work fast enough for clinical environments.